Blue Phase LCD TVs "to blow away competition"
You know all about Blu-ray already, but we're betting Blue Phase is a new term to wrestle with - it's certainly a surprise to us. Fortunately, however, the newcomer has nothing to do with HD TV video formats. 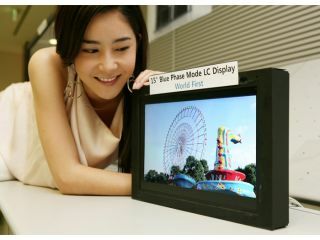 Instead, Blue Phase describes a brand new kind of LCD panel, as announced today by Samsung in Korea. The company says it will show the world's first Blue Phase LCD later this month in the US. As for why we should sit up and pay attention, the key is in the refresh rate. A standard high-end LCD TV set can refresh at 120Hz but, Samsung claims, Blue Phase doubles that to 240Hz. Instead, the Blue Phase crystal aligns itself, which contributes to the faster refresh rate and a far lower production cost. Significantly, the end result should be a far better image. Samsung executive vice president Souk Jun-hyung explained: "Our Blue Phase mode is a major evolutionary development beyond conventional liquid crystal modes. Samsung's development of the technology provides a tremendous opportunity to move image quality of LCD screens much closer to that of a real moving image." A 15-inch Blue Phase module will be on show from 18-23 May at the Society for Information Display 2008 show in Los Angeles, with mass production to follow in 2011.